Susie Harris: Life is short. Commissioned work is my favorite. its fun to see other peoples ideas take form. I was asked to paint this piece for a sweet client. She is a teacher....God bless her! Wonder if this piece will end up in her class room? I think I need one of these at my back door..ha! That is really cute! I love the saying, and the way it looks. Love this song. Love this piece. Commissioned work is some of my favorites too, as you say it pushes me out of my creative box and I surprise myself at times. Sometimes I really don't like what I have done and the customer will fall in love with it assuring me it is exactly what they wanted so I have to just go with the flow. I love this one, I think it turned our great! So cute - what a fantastic saying. Love the different angles of this one. Great job! Love the words and how you placed the text. Very Nice! 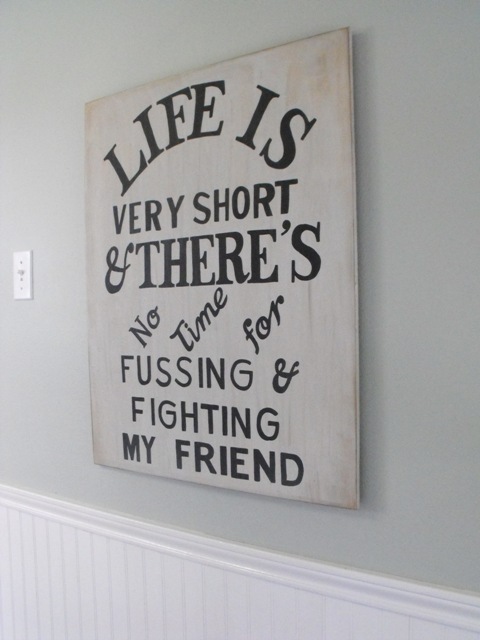 One of my favorite Beatles songs.....your signs always make me smile Susie!! oh i love it, as a mother of 4 kiddos this is very needed!!!! I love this and really need this! At home and in my classroom! :) Great job Susie! It's a great sign, Susie and you did a wonderful job! This is beautiful and so true.. I need one too. Would you make more?? ?